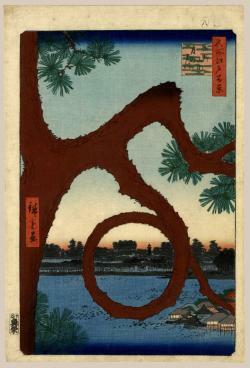 Ando Hiroshige was born in Edo in 1797, the son of the warden of the fire department assigned to Edo Castle. He showed an early interest in art and first studied under Okajime Rinsai. 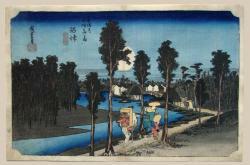 In 1811, at the age of 14, he became a pupil of Utagawa Toyohiro and also studied "Nanga" painting under Ooka Umpo. During this period he became interested in Western art. 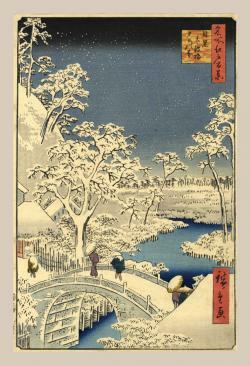 In 1812, he was rewarded with the "nom d`artiste" Utagawa Hiroshige. Ando Hiroshige is his actual name. In 1833, the year following his trip along the Tokaido as a minor retainer in an official mission of the Shogun of the Kyoto Court, he produced his famous "Tokaido Gojusan Tsugi", (53 Stations of the Tokaido Trail). 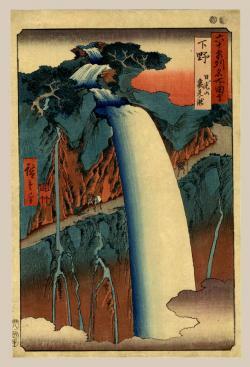 He gradually gave up figure prints for landscape and "Kacho-ga", subject matter provided by many trips throughout Japan. 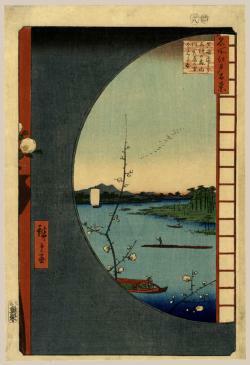 Hiroshige was very prolific and his total production numbers about 8,000 known works of art. 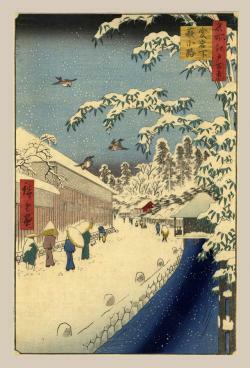 His delightful, charming and dexterious portrayal of Japanese life and topography made Ando Hiroshige deservedly popular in the West, and more than any other printmaker, he was responsible for the Westerner's view of "quaint Japan". His prints and sketches show great technical virtuosity and a naturalistic yet often dramatic view point. 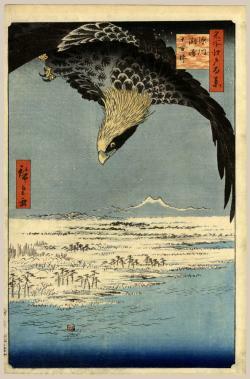 When the Japanese print was re-discovered in Europe at the end of the 19th Century, it was Hiroshige who gave Western artists -- including Whistler, Cezanne, Toulouse-Lautrec, Gauguin and Van Gogh -- a new vision of nature.